There are so many ’styles’ in knitting symbols. The Japanese have perhaps the most comprehensive collection of symbols. More important, the Japanese have been the most consistent in usage of symbols by all the designers published in that language. However, the symbols used in the Japanese system for the simple knit and purl stitches make my eyes crawl. If you are unfamiliar with the Japanese symbols, the symbols for knit and purl are and respectively. In isolation, they don’t look so bad, but wait till you have a 20 x 20 pattern that switches from knit to purl all over it. You will start to be confused and if you have any vision issues the and combination will only amplify your problems. 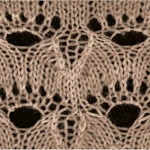 I prefer the symbols for knit and purl used by Barbara Walker, and respectively. Is there a ’standards board’ that develops and promulgates standards for how knitting patterns are documented? I see bits and pieces of this type of thinking spontaneously arising in several sources. But it is still all over the place. I would like to see a body of learned knitters come together to fill this gap . We need a standard, used by all nationalities regardless of language, to which we could hold all future knitting documentation. If this was established, it would also form a standard for documenting the updating of historical knitting documentation. And it would assist in the consistent translation of knitting documentation from one language to another.